TEAM ILLINOIS RECLAIMED THE NATIONAL CHAMPIONSHIP FOR THE FIRST TIME IN THREE YEARS. 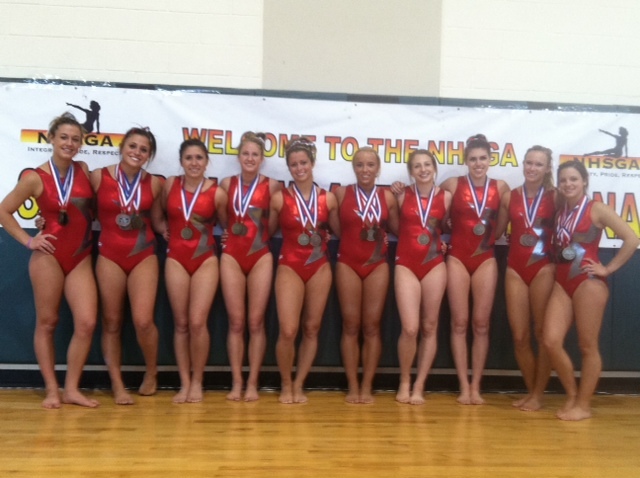 TEAM ILLINOIS WON THE NATIONAL HIGH SCHOOL GYMNASTICS ASSOCIATION SENIOR SHOWCASE last Friday and Saturday (May 20 & 21) at the Estero Community Center in Estero, Fla. Team Illinois scored 149.625 and won handily over teams representing Massachusetts (148.525) and New Jersey (148.250), which had won the previous two titles, in the nine-team meet. The local contingent posted the top scores on uneven parallel bars (37.40) and balance beam (37.675). Jessica Morreale (DeKalb) was the all-around champion with a 38.675 total. Alexa Messina (Sandburg/Stagg co-op) was fifth (37.275). Morreale also won floor exercise (9.725), and bars (9.675). She was second on balance beam (9.475) and fourth in vaulting (9.325). Caitlin Barrett (Schaumburg) finished in a tie for third on beam (9.25). Messina was fourth on bars (9.20), fifth on beam (9.15) and seventh in vaulting (9.125). Maegan Wochinski (Fremd) placed eighth on bars (8.675). Caitlin Pagano (Stevenson) tied for 10th on floor (8.95). In all-around, Wochinski placed 14th (36.275), Monica Wolf (New Trier) tied for 17th (35.275), Barrett placed 20th (35.45) and Pagano was 28th (34.825). Note: beam results currently are unavailable on the website. The link for beam has floor results, as does the link for floor. The following individuals will compete at the NHSGCA Senior Showcase Invitational Saturday and Sunday at Salem High School in Virginia Beach, Va. The following individuals will compete against Team Texas at 2 p.m. Saturday at Conant High School in Hoffman Estates.